Safe to say the styling will be an acquired taste. Hyundai has been quietly teasing the Kona in recent weeks, the Korean manufacturer’s first subcompact crossover to rival the Nissan Juke. Subsequent teaser images have hinted that the Kona will feature a bold new design direction compared to some of the dreary designs we’re used to seeing from Hyundai. While the teaser images gave us little to go on, our clearest look at the subcompact crossover came courtesy of spy shots. Until now, that is. Photos of the Kona out in the wild have emerged on Autoweek devoid of any camouflage – and the design is just as quirky as we were led to believe. The Hyundai Kona was spotted in Lisbon, Portugal while shooting a commercial. As hinted at by Hyundai, it sports sleek LED daytime running lights above the main headlights, which is similar to the Jeep Cherokee’s polarizing design. It's safe to say the styling will be an acquired taste. Elsewhere, the images reveal a two-tone paintjob with a contrasting black gloss roof, so chances are this is the range-topping edition. Other design quirks include flared wheel arches, and slim rear taillights which look similar to the i20. 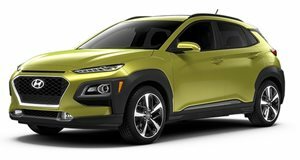 The Kona’s name is derived from the Big Island of Hawaii, just as the Hyundai Santa Fe, Tucson, and Veracruz are named after travel destinations. Let’s hope the performance can live up to the Kona's exotic looks. Hyundai is expected to unveil the Kona to the public at the Frankfurt Auto Show in September, but we should see an online reveal before then. There's still no word yet on US availability, but Hyundai's current SUV lineup in America has a subcompact-shaped void waiting to be filled by the Kona.